The binding characteristics of pirenzepine and oxomemazine to muscarinic receptor were studied to evaluate the selectivity of oxomemazine for the muscarinic receptor subtypes in rat cerebral microsomes. Equilibrium dissociation constant (KD) of (−)-[3H]quinuclidinyl benzilate([3H]QNB) determined from saturation isotherms was 64 pM. Analysis of the pirenzepine inhibition curve of [3H]QNB binding to cerebral microsome indicated the presence of two receptor subtypes with high (Ki=16 nM, M1 receptor) and low (Ki=400 nM, M3 receptor) affinity for pirenzepine. Oxomemazine also identified two receptor subtypes with about 20-fold difference in the affinity for high (Ki=84nM, OH receptor) and low (Ki=1.65 μM, OL receptor) affinity sites. The percentage populations of M1 and M3 receptors to the total receptors were 61∶39, and those of OH and OL receptors 39∶61, respectively. Both pirenzepine and oxomemazine increased the KD value for [3H]QNB without affecting the binding site concentrations and Hill coefficient for the [3H]QNB binding, Oxomemazine had a 10-fold higher affinity at M1 receptors than at M3 receptors, and pirenzepine a 8-fold higher affinity at OH receptors than at OL receptors. 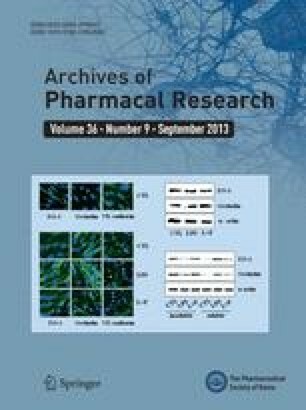 Analysis of the shallow competition binding curves of oxomemazine for M1 receptors and pirenzepine for OL receptors yielded that 69% of M1 receptors were of OH receptors and the remaining 31% of OL receptors, and that 29% of OL receptors were of M1 receptors and 71% of M3 receptors. However, M3 for oxomemazine and OH for pirenzepine were composed of a uniform population. These results suggest that oxomemazine could be classified as a selective drug for M1 receptors and also demonstrate that rat cerebral microsomes contain three different subtypes of M1, M3 and the other site which is different from M1, M2 and M3 receptors.